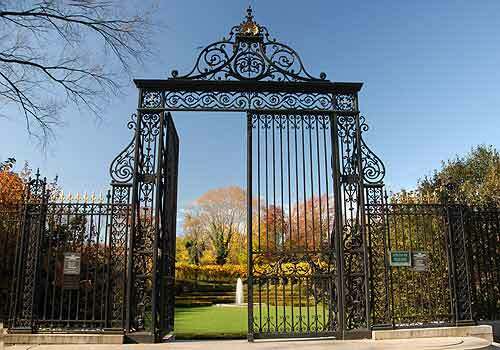 The entrance of Conservatory Garden, Vanderbilt Gate is considered one of the finest examples of wrought iron work in New York City. Designed by American architect George B. Post, it was made in France and adorned the mansion of Cornelius Vanderbilt II at Fifth Avenue and 58th Street. Later, Gertrude Vanderbilt Whitney, founder of the Whitney Museum of American Art, gifted the gates to the City. Beyond the gates lie the six wonderfully sculpted acres of Conservatory Garden, the Park's only formal garden. Today, the gates are used as the backdrop for countless wedding photographs. They're also the hallmark entrance for the annual Frederick Law Olmsted luncheon of the Conservancy's Women's Committee. Conservatory Garden, Main Garden entrance inside the Park at 105th Street and Fifth Avenue.